It’s spring outside and inside here at Gracie’s, and our new May à la carte menu has officially launched! Inspired by high-quality, locally-sourced ingredients, our new offerings showcase the best of the season currently being unearthed here in New England. Please join us for a fresh and delicious take on springtime cuisine! Our new spin on the Crescent Farms Duck is light and bursting with spring vegetables. 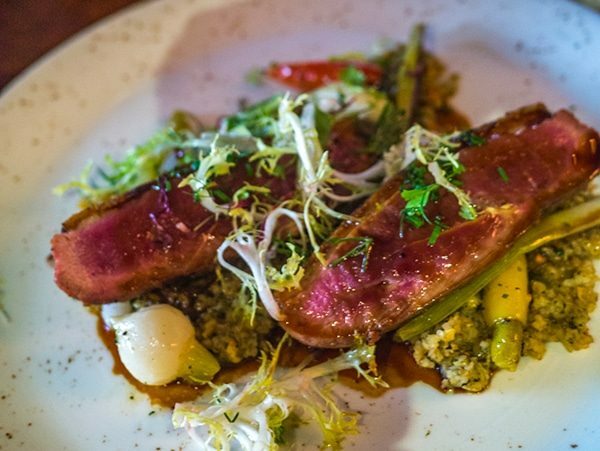 The duck is seasoned with our signature “Crack Spice” and paired with green wheat, hakurei turnip, young carrot, spring onion, and rhubarb hoisin, which acts as a barbecue component to the duck. The entire dish is then garnished with lovely local tendrils from Deb’s Pea Greens. Arctic Char from Iceland is being served crispy-skinned with spring vegetables a la grecque (“in the Greek style”)—a light, fresh, textured combination of fennel, carrots, turnips, pearl onions, and radishes as they come in. 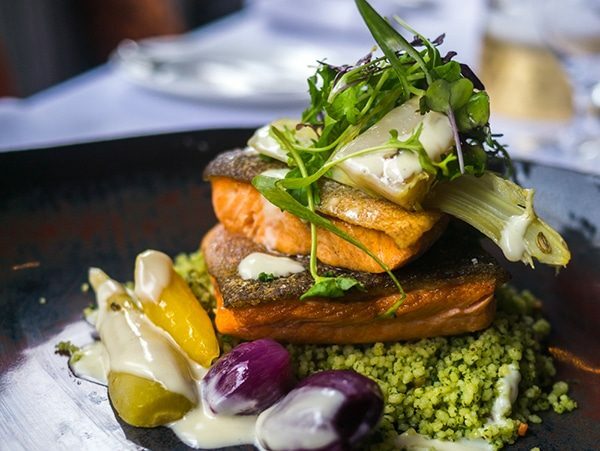 The char is served over Moroccan couscous dressed in a basil pistou atop a delicate, fresh salad, and finished off with a Meyer lemon beurre blanc and delicate spring herbs. 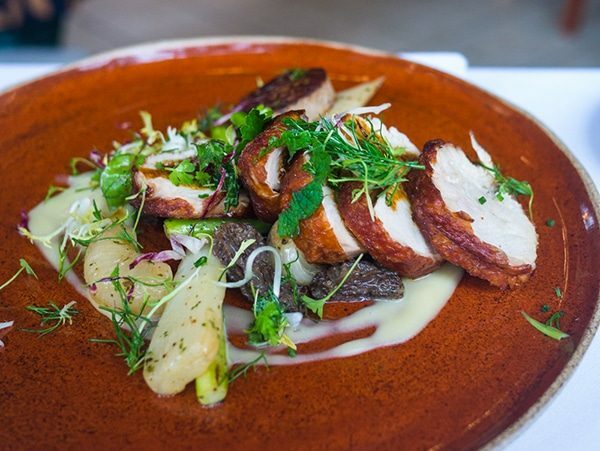 Our friends at Pat’s Pastured take center stage in a dish of Pat’s Chicken & Sausage, which features breasts and thighs of the Poulet Rouge variety. The dish also features local morel mushrooms from RI Mushroom Company (typical in the month of May), local green asparagus from Schartner Farms, smoked potato, cipollini, and a savory-vermouth jus using our rooftop garden winter savory! 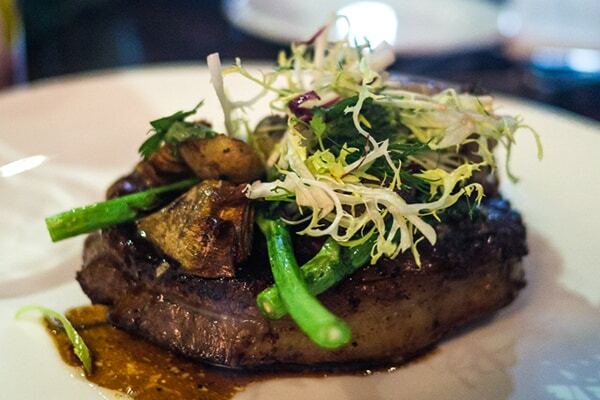 Lots of flavors and textures are happening in the Dry Aged Creekstone Ribeye, which is finished with black garlic Bordelaise and topped with a quinelled piquillo pepper tapenade, broccoli rabe, charred potatoes marinated in herbs and olive oil, and crispy fried artichokes! There’s still much more to discover on our menu as we move deeper into the season and make the most of the local harvest. As always, the full à la carte menu can be found on our website at https://graciesprov.com/menu/. Please join us soon to celebrate summertime, sunshine, and the sweet and savory delights of the coming months!